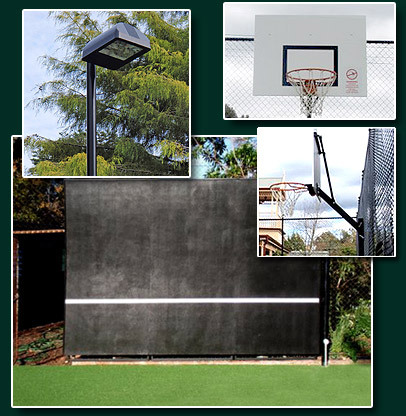 Professionally installed LSI Hamilton Metal Halide lights provide ample, even lighting across your new court or green. Glare-free visibility for players and spectators. Weather tight construction with easy lamp access. Lighting layouts designed for the best possible coverage. Providing security while keeping stray balls on your property, BoagSPORTS can design fencing systems to suit your needs. Secure black PVC chain mesh fencing allows an unrestricted view or a Retractable Draw Curtain can be extended for play then hidden from view. Parabolic hitting walls and ball machines for solo tennis practice also available. Designed and engineered retaining walls and landscaping add extra value to your property while giving you that resort holiday feeling every time you step on the court. Expertly constructed and guaranteed workmanship will put your mind at ease. We also supply and install Allsports net posts with polished stainless steel winder body, post caps and handle. For solo practise we can install a parabolic hitting wall with net height marking. 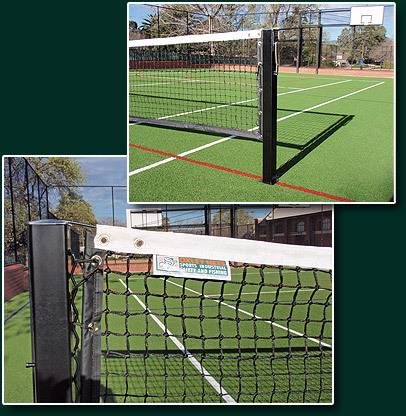 The finishing touch to the perfect court is an Oxley professional quality tennis net. Made to last with UV stabilised materials for extreme weather protection... you can't lose! BoagSPORTS synthetic sports surfaces are finished off with built-in long lasting line markings to exact laser measurents. Whatever your game - tennis, bowls, athletics, hockey or soccer, we'll ensure your court or field is of world standard. BoagSPORTS can supply and install professional style basketball backboards with snap down ring. Adjustable height setting to suit junior, intermediate and championship height... Game On!